I’m taking a couple of journalism classes at PCC because I think it will help me become a better blogger. One of the classes requires students to subscribe to a physical newspaper, so I chose the Pasadena Star-News. 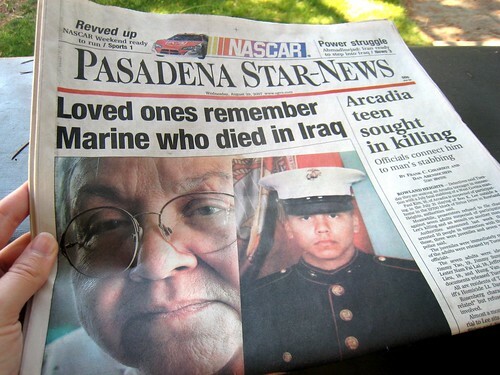 I read the Star-News (as well as Pasadena Now, of course) online already. I like to read my news online. Even more specifically, I like to read it in my RSS reader. But I also want to support local professional journalism. I’ve been thinking about this lately, and even after this class is over, I’m planning on keeping my subscription to the Star-News because I want to support local journalists. I wish there were subscription options for people like me who don’t want paper dropped off at their house every morning. I get the Star-News as well. It’s useful for local news which doesn’t make it into the Times. But I wish they did a better job of separating opinions from news stories. It’s not uncommon to find statements in front page stories which should have been saved for the editorials page. I read the PSN every day. If there wasn’t a Star-News, my website would not exist. on August 30, 2007 at 4:36 am | Reply Kalea Chapman, Psy.D. Roy Peter Clark’s pieces are particularly helpful. You can find his older “50 tools” articles in the internet archive. And may I put in my three cheers for PCC’s classroom offerings? I’ve taken classes in their Computer Graphics labs (most recent, last spring), and it’s a great way to learn a new software app for not-that-much-per-unit. (it does take a chunk out of two days of the week, tho). Are you taking photojournalism? The PJ teacher, RF, is very very cool. Not yet, but I want to take it next time around. I though I would interject here because you have stumbled upon a subject that’s interesting, too say the least. I’ve been following this conversation on how boring Pasadena newspapers are and, being a reporter in this city, I agree. But what your saying is different by the way of getting involved in the process of learning Journalism. I don’t know that bloggers report? But they do complain. And complain about everything. I was the managing editor for the Courier and oversaw what news went into that paper, I’ve worked at number of them since. You’re onto something here by learning how news is compiled and the role blogs, or all online, publications might play in the future of reporting. Warren Swill, former news editor for the PNS, and now the adviser for the Courier just wrote a piece in the PNS Friday on how fast news goes online and that threat, obviously from the bias of a print reporter, but he left a few things out. The future of news is in investigative reporting, just for the shear fact that it’s a dead art. Let me say this; forget the citizen journalist, or the idea of disseminating news through a cell phone. If that were the case the “stale blog” itself is dead, and “mo-blogging” is the future. Not so. Live blogging is also, in most cases, incoherent. Speed is not the answer. What the PSN has to do, as goes for all dailies, is make the paper free and give the public nail biting, front page “oh my” news. The gate keepers of the old world press no longer have the keys and now stand dumbfounded at the floodgates of information. I would also go so far as to say printed blogs might not be so bad, as well. Aaron Proctor, if your listening? I few hundred copies outside the council chambers. We need a fun read waiting until 1 a.m. for public comment. Free is a hard thing for any newspaper that’s losing subscribers to swallow but think of what their competing with? Themselves, “free” online. D’oh! In a business model do you give away the best you got, or pretend to give it all away? The things killing newspapers, are cragslist and ebay, not blogs or the “24/7” news cycle, anyway. Nobody cares. Good reporting wherever it shines will always be read. Once print reporters figure this out and stop their whine we can all get back to reporting. I strongly encourage everyone to at least go learn about journalism, and even go write for a newspaper, I can’t say enough about the Courier except it’s an opportunity that ought not to be missed. That’s an interesting idea — paper blogs! You might have something there. I could totally print out like a “best of” my blog every Monday and lay it down at City Hall.